As I mentioned in my previous post, I want to spend the next few weeks being very honest with you in sharing some of the sins that I struggled with during mom’s sickness and even after her death. Worry had always been a sin that I struggled with, but as you might expect, this kicked into high gear when Mom was diagnosed, and even after she passed away. I worried about what would happen to her. I worried about how our lives were going to change. I worried about if she was going to be able to see my brother graduate high school, or be at my wedding. I could give a list a mile long of how I worried during this time, but that really isn’t the point of this. The point is to share with you my struggle with this sin, and what the Bible says about it. First things first. Worry is indeed a sin. Jesus clearly states this in His Sermon on the Mount in Matthew 6:25 when He says, “Therefore I tell you, do not worry about your life, what you will eat or drink; or about your body, what you will wear. Is not life more than food, and the body more than clothes?” Jesus clearly says do not worry. Jesus doesn’t say, “If things are going great, then don’t worry, or try not to worry.” No, Jesus commands us not to worry. Therefore, when we do something that directly goes against any command that Jesus has given, it is a sin. Jesus doesn’t command us to not worry for no reason. Jesus’ commands are for our good and for His glory. So, because He is so loving, after commanding us not to worry, He goes into more detail giving us reasons of why we should not worry. I believe that we can find 9 reasons not to worry in Matthew 6:25-34. Today, I would like to discuss the first 4 reasons, and then we will discuss the last 5 reasons in another post. 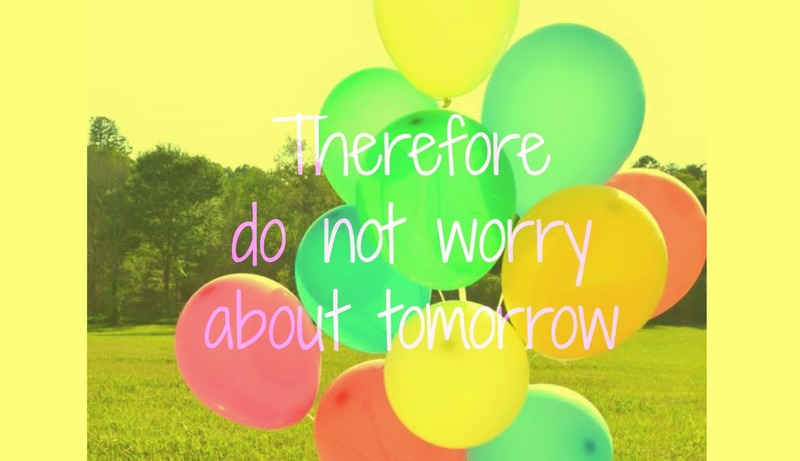 We should not worry because God is our Father. He is our good and faithful master (vs. 25). If you look in verse 25, you will notice that Jesus begins His command with the word “therefore.” This means that we need to look at previous verses for further explanation. The verses before (Matthew 6:24) talks about Jesus being our master. However, Jesus is not like just any master. Jesus is a loving master. He is faithful to His children, and He is good to us. Jesus is our Father. Since He is master over our lives, there is no need for us to worry. He is in control, and He has our best in mind. We should not worry because life is about more than food and clothes (vs. 25). Jesus mentions this at the end of verse 25. If I’m honest, I know that I am constantly worrying about trivial things such as clothing, people’s view of me, what’s for dinner, etc. Jesus clearly tells us that life is about more than trivial matters. I think when we gain an eternal perspective on life, then our desire and need to worry will fade. We should not worry because God feeds the birds (vs. 26). God is in control of nature and provides the birds (and all of nature) what they need; however, Jesus tells us that we are much more valuable than the birds. We are children of God and made in His image (Gen. 1:27), the birds are not. If God takes care of the birds, who have less value than we do, then why wouldn’t He take care of us, His children that were made in His image? Just from looking at these first 3 verses of this passage, we can already see that there are so many reasons of why we should not worry. Be on the look out for part 2, when we will continue looking into this passage to see why Jesus commands us not to worry. Previous postThe Struggles I Faced.